Looking around the room at the other participating candidates it was soon evident that between us all, was represented a few thousand dives, most of which had been completed in the UK. Likewise the lecturers delivering the theory part of the course were themselves not without considerable experience, with two National Instructors, Andy Hunt and Dave Mitchell, also being ably assisted by OWI Simon Smith. The majority of the participants were from Tyneside 114 who had organised the event, but included Peter from Durham City Divers and Ian from Hexham BSAC branch. The aim of the day was to work our way through the student handbook and complete the 4 theory sections of the BSAC Advance Diver programme. 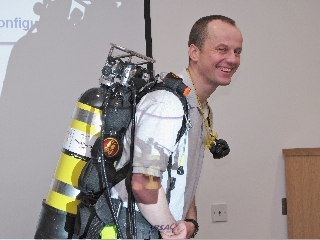 The first lecture, AT1, kicked off with a review of the role of the advanced diver, as well as focussing on the responsibilities involved in dive management, with much emphasis placed on the importance of sound planning of dives particularly at unknown and unfamiliar sites, using charts and a range of other interactive resources such as the internet to check for weather conditions. For all of the participants most of the material was not new; however it is surprising how much knowledge is forgotten with time as was brought home all to clearly when working through a case example of a dive plan using the rule of twelfths to work out the actual depth of water over a wreck at slack water! AT2, advanced diving, again covered the importance of sound planning and preparation whilst developing personal skills and techniques and supporting others in gaining more dive experience/skills. As well as looking at the factors that are required to minimise risk in what is potentially a hazardous activity there was also a focus on more specialised dive equipment; this included the use of lazy and trapeze shots to aid decompression stops. 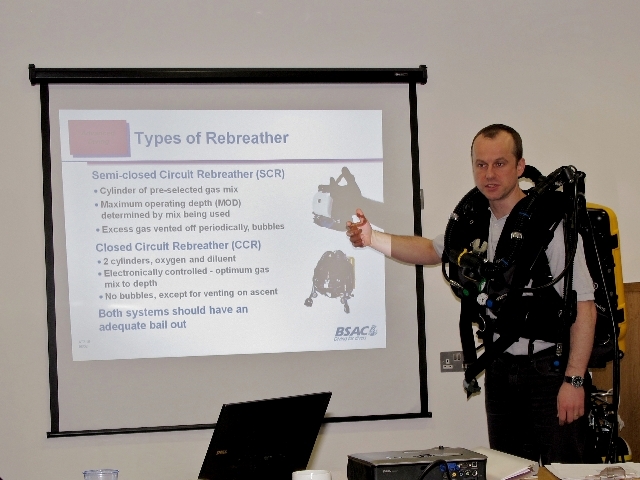 Both surface and underwater search techniques were also covered and discussed as well as the use of more specialist techniques for more adventurous diving including the use of trimix gases, rebreathers and full-face masks. The importance of the advanced diver setting a good example to less experienced divers and the general public was continually emphasised. The importance of good communication to effective dive management as well as the art of delegation and prior planning was again highlighted. Particular importance was attached to the effectiveness of a good dive managers brief’ as well as the keeping of accurate records and being able to evidence the planning that had taken place both prior, during and after the dive. 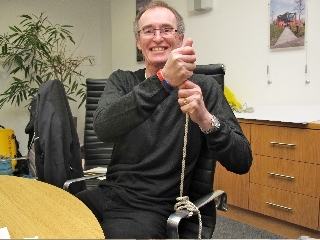 This lecture also covered other useful reminders about general sea awareness/seamanship, including buoyage, the rules and rights of way at sea and some practical rope work which included participants using lines to tie bow lines, anchor bends, half hitches etc. AT4 covered a review of diving conditions and onsite first aid, again nothing new to all of this information as most if not all of the material had already been well covered on previous BSAC Dive Leader / Sports Diver training and skill development courses; it never the less served as a useful reminder of the medical problems that can occur in a diving environment and there treatment such as DCI, narcosis and oxygen toxicity. The importance of good management and control of such incidents was discussed. In order to enliven this particular and avoid death by PowerPoint this particular lecture also involved a practical exercise where candidates matched symptom cards to identified diving medical conditions and discussed their treatment. 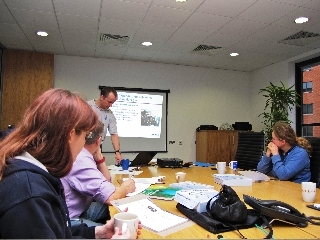 The training event concluded with a review of the forthcoming Tyneside 114 dive season. 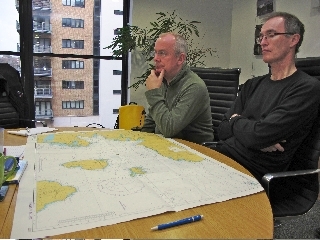 Over the coming season the plan is for the candidates involved in the above Advanced Diver programme to take an active lead role in the planning and management of club dives at new sites / expeditions with the aim of putting theory into practice. 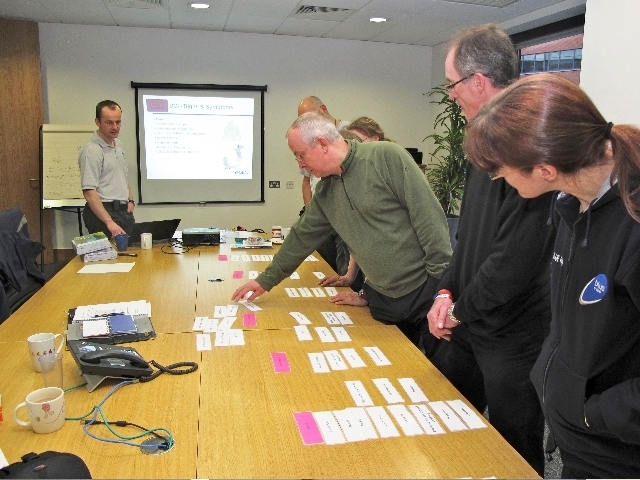 Thanks to Andy Hunt, Dave Mitchell and Simon Smith for organising and delivering the instruction on this course. Special thanks to Nicola who organised the excellent training venue courtesy of WYG Environment.